Lassitude of the waning monsoon has been a great blessing here. It has resulted in blossoms and blooms, butterflies have been spotted in great numbers and greatest varieties ever, profuse fruition of the berries and wild fruits have made the countryside a haven for birds. The recipe has been tweaked and changed to suit, butter has been replaced by olive oil, egg has been omitted and figs and almonds have been added. This is how I made The Brazilian Fruit Bread. You can see the original recipe here. Heat milk till very hot. Add sugar and stir till sugar dissolves. Let it cool. Toss the chopped fruits and nuts in one tablespoon of flour. Whisk together remaining flour and salt. Add olive oil. Mix well. Add powdered cinnamon and nutmeg to flour. Add milk mix to flour and knead for 6 to 8 minutes to get soft dough. Add more warm milk if the dough feels tight. 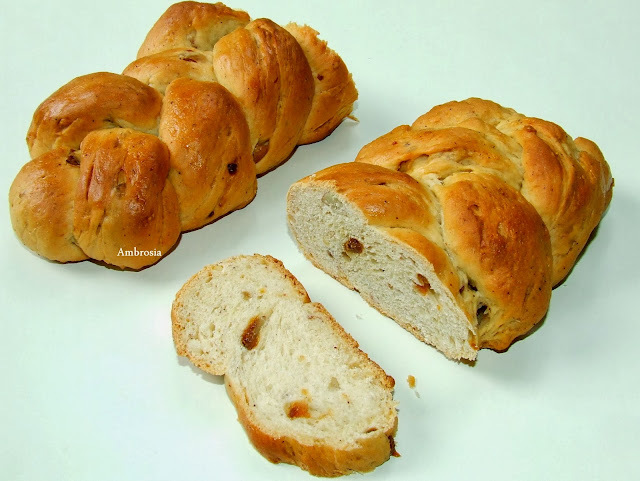 Stretch the dough in the kneading plate and sprinkle dry fruits and nuts. Knead for another 5 minutes. Cover the dough and let it rest for 20 minutes. Knead again for 2 to 3 minutes. Divide the dough into three parts. Make a braid as shown in the picture. Cover and keep it to rise for one hour. Bake in a pre heated oven at 190 degrees for 35-40 minutes. Cover with a foil if the bread turns brown and there is still some time left. Remove from the oven and cool in the rack. Slice when cold. Hi Namita... such a pretty bread! 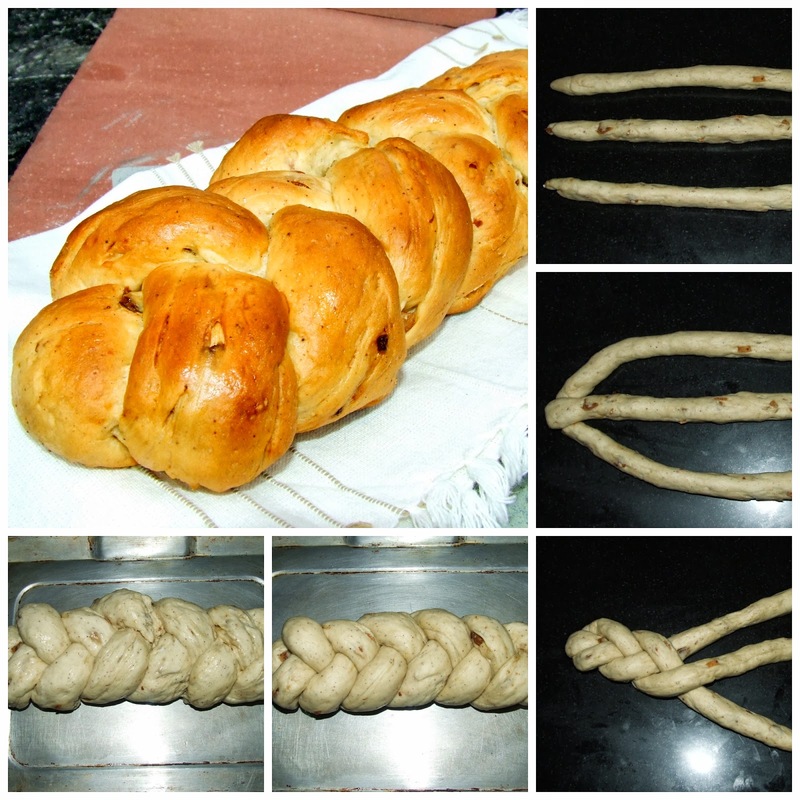 Isnt it fun to give breads some very interesting and lovely designs. 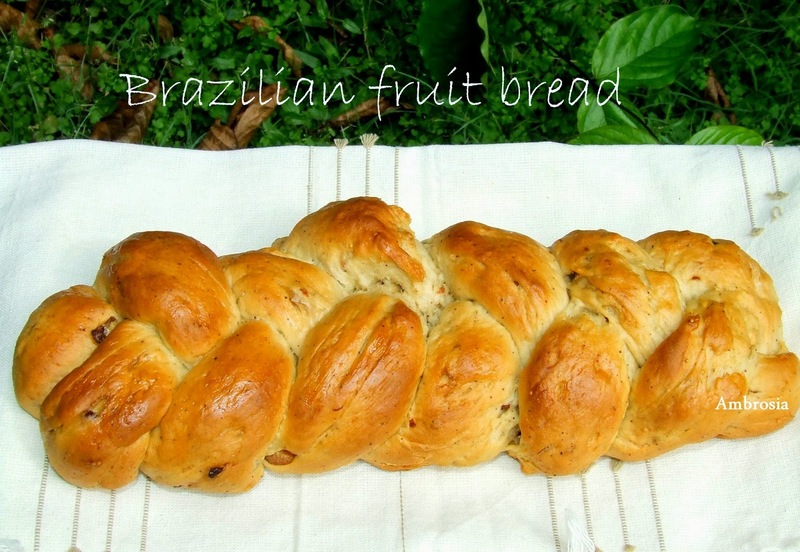 You are a pro at it and this is yet another beatuiful bread from your kitchen! I love braided breads and this has such finesse. Love the way you have adapted the recipe to suit your likes. Looks so tempting, will be trying this next! Hey, I made this bread weeks back. Came out really well!